We need to know: What does the gospel have to do with our everyday lives in the home? How does the gospel impact our dish washing, floor mopping, bill paying, friend making, guest hosting, and dinner cooking? How does the fact that Jesus himself bore our sins in his body on the tree so that we might die to sin and live to righteousness make a difference in my mundane life today? The big question she explores is simply this: How does the gospel change the way a woman lives out her calling as a homemaker? In the first section of the book she looks at the gospel, saying “Theology is for homemakers who need to know who God is, who they are, and what this mundane life is all about.” My favorite chapter here is “Don’t Smurf the Gospel.” Furman is both amusing and convicting as she writes about the importance of properly defining the gospel and properly distinguishing between the gospel itself and its many implications and applications. If “smurf” is a word the Smurfs used when they didn’t know what else to say, “gospel” is a word many Christians use whether they really meant it or not. It’s a word that may mean very different things to different people, so Furman calls for clarity and precision in its use. 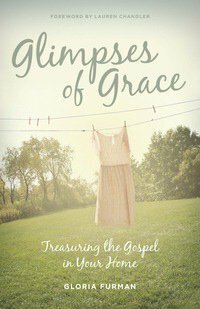 The second section, the bulk of the book, looks at a homemaker’s many callings and shows how the gospel speaks to each of them. The chapter titles give a sense of the subjects and the tone: “Divine Power and Precious Promises for the 2 a.m. Feeding,” “All Grace and All Sufficiency for Every Dinner Guest,” “Treasures In Jars of Clay, Not in Fine Bone China.” One of the stronger chapters in this section is “The Idol of a Picture-Perfect Home.” I appreciated this chapter because there is such a clear gospel remedy and gospel application to the kind of heart idolatry that desires and demands the illusion of a picture-perfect home. Aileen and I both read this book and both enjoyed it a lot. We saw that Gloria uses both precision and grace as she shows that the good news, when properly understood and carefully applied, must transform the way a woman carries out the task the Lord has given her.